Winter rye cover crop being rolled ahead of incorporation and field prep for summer crop. Photo: Jeff Mitchell. Fall is the time to plant your winter cover crops. The impact of cover crops can be variable, depending on plant variety and management practices. Choosing the right cover crop is important and deciding what to plant will depend on your on-farm goals. Cover crops add organic matter to soil, which increases microbial activity, and leads to good soil aggregation and improved soil structure. This increases water infiltration and reduces the risk of soil compaction. In addition, cover crops can provide nitrogen for subsequent crops, suppress weeds, provide floral resources for beneficial insects including bees and natural enemies, and reduce soil erosion and nitrate leaching. Some of the benefits of cover cropping won't be seen in the first year but maintaining good soil quality is important for long term on-farm productivity. Cover crops can involve additional costs and management. We recommend planting cover crops that work with your existing farm equipment to keep costs down. Additionally, some cover crops can favor pests and should be avoided in certain crop rotations. For example, bell beans are a key host for tomato spotted wilt virus, which is vectored by thrips. Mustard and radish attract beneficial insects but are also significant hosts for pests such as stink bugs, cucumber beetles, flea beetles, and Lygusbugs. Common cover crops include legumes (vetch, clovers, bell beans, field peas), grasses (wheat, triticale, oats), and brassicas (mustard, radish). There are advantages to all of these and the decision to plant one over the other can be driven by what you are trying to achieve. Legumes fix nitrogen from the air into their roots through symbiotic relationships with rhizobia bacteria. If your goal is to increase nitrogen for subsequent crops, planting a high-biomass legume is best. The amount of nitrogen fixation by a cover crop is related to plant biomass. Thus, the optimum time to incorporate a cover crop for peak nitrogen fixation is at the flower bud stage. Too early would be a loss in biomass (and N) and later in the season risks the cover crop setting seeds. Once legumes start to set seed, the nitrogen will be moved into the seed and will not available for subsequent crops. Plus, you may have problems with weed seeds in subsequent crop rotations. Be sure to inoculate legume cover crop seeds with the right strain of rhizobia bacteria to make sure legumes can effectively fix nitrogen while growing. Non-legume cover crops (small grains, brassicas) do not fix nitrogen, but many grasses and brassicas are relatively deep rooted—allowing them to mine nitrate that remains in the soil profile from the previous crop, or that has leached below the root zone for more shallow rooted crops. Thus, cover crops can improve nitrogen cycling in the field by reducing the amount of nitrate that is lost from the system. Deep rooted crops (like daikon radish) may also help alleviate soil compaction by opening up the soil. Another advantage of using grasses and brassicas is that they produce a lot of biomass, and often have fast initial growth, enabling them to outcompete weeds. Due to their higher carbon to nitrogen ratio, grasses won't break down as rapidly and may reduce the amount of available nitrogen in the soil for a period of time. Brassicas have a lower carbon to nitrogen ratio and will break up more quickly. 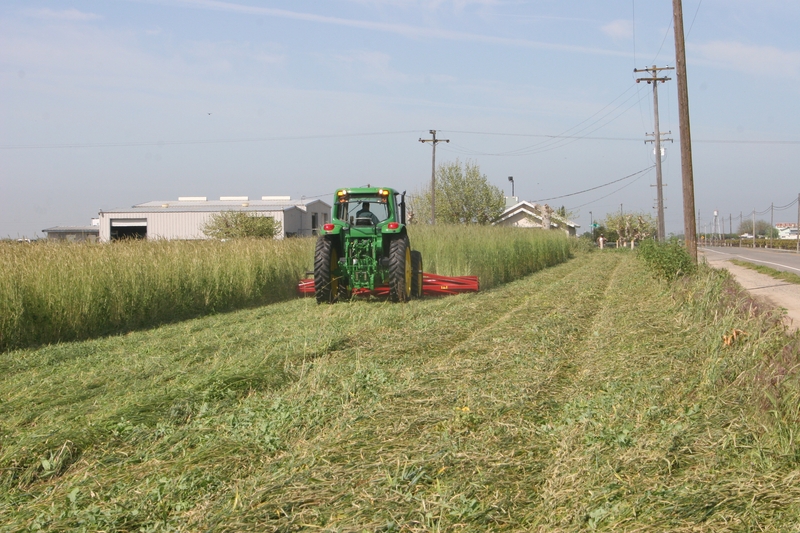 Some growers have had success planting a cover crop mix, for example a 2-seed combination of a grass and a legume, or a mix with 3 or more seed varieties. If planting a mix, keep seeds well mixed in the hopper and plant to a “compromise depth.” in other words, if one type of cover crop wants to be planted at 1-inch, and the other at 3-inches, plant both at 2-inches. Do not let your cover crop go to seed. If it goes to seed, it can become a weed in subsequent years. This is very important for realizing the benefits of cover cropping, without introducing new problems on your farm. Cover cropping can be an opportunity to experiment on your farm. If you aren't sure what will work well and there are several cover crops that interest you, try planting them in strip trials in a field. This will allow you to evaluate which work best for your management system and equipment. I'd be glad to talk with you about planting a cover crop on your farm. Feel free to contact me at selight@ucanr.eduor 530-822-7515.